The interiors of the detention centers where children are being kept from their parents are still largely out of public view because the government has gone to great lengths to keep the media at bay. NEW YORK (CNNMoney) - We're still not seeing the full story of President Trump's so-called "zero tolerance" immigration policy. The interiors of the detention centers where children are being kept from their parents are still largely out of public view because the government has gone to great lengths to keep the media at bay. As a result, the public is only seeing the conditions of the centers through the lens of the government -- not through the lens of independent photojournalists. Journalists have been clamoring for access, but there have only been a handful of tours. During the tours, journalists have been forbidden from recording anything. 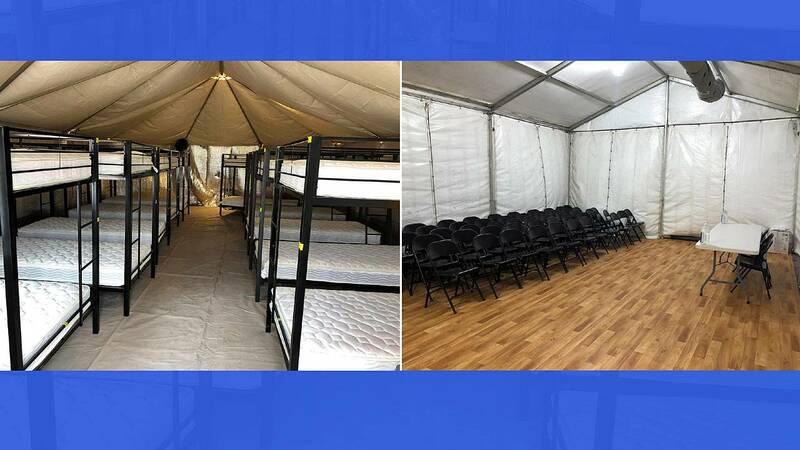 Fox News correspondent Jeff Paul, reporting outside a temporary shelter in Tornillo, Texas, said on Wednesday that he "couldn't stress enough" that access has been limited. "We have not been allowed to go inside and view this with our own eyes," he said on the air. Paul said "we've asked every day that we've been out here." CNN and other major networks have been asking, too. The government cites privacy concerns and says it is trying to accommodate requests, but many observers are skeptical. BuzzFeed News sent a letter to the chief counsel of U.S. Customs and Border Protection on Wednesday requesting that a reporter be given access to a previously scheduled tour of the detention center in McAllen, Texas, on Thursday. The letter said that the delegation of religious leaders attending the facility agreed to accommodate BuzzFeed's reporter and questioned why CBP said "we might not be able to accommodate media for this engagement." It's part of a broader pattern of problematic secrecy. "The federal government is being opaque about many aspects of the child separation issue, blocking lawmakers and media from the sites, not providing all the information to the public as soon as they have it," CNN's Jake Tapper tweeted on Wednesday. Trump welcomed the news media's cameras when he signed an executive order on Wednesday reversing parts of his own policy. But there isn't anything in the order about what will happen to the children who have already been separated from their parents. Some of the children have been transported halfway across the country. NY1, the all-news cable channel in New York City, caught captured on camera five girls being brought to a foster agency in East Harlem at 12:45 a.m. Wednesday. The video was widely shared by critics of the policy on Wednesday. Reuters had photographer Mike Blake fly over the Tornillo facility to gather aerial images. One of his shots of children walking single-file by a row of tents was used on the front page of the Washington Post on Wednesday. Most of the other images used to illustrate the issue have come from government handout photos and videos. Journalists who toured a detention center in El Cajon, California, last Friday were able to describe what they witnessed, but the only images came from the Department of Health and Human Services. And the images only showed older boys -- which prompted some viewers to ask "where are the girls?" and "where are the babies?" The same thing happened on Sunday when members of the press were allowed inside a warehouse-like detention center in McAllen. CBP later provided pictures of holding pens made from chain-link fences -- which were widely depicted as "cages." Newsrooms faced a dilemma: Use the government's pictures, or don't have any pictures at all. Most major news outlets, including the Associated Press, CNN, Fox, and The Washington Post, published what the government provided. Notably, the New York Times decided not to. "The New York Times decided as a newsroom not to publish the government handout photos of the border shelters where migrants are being held, because news photographers were not allowed in," The Times said in a statement to CNN. The Times' view is that using the government photos this time will make it harder to lobby for access next time. Washington Post executive editor Marty Baron said his paper evaluates these situations "case by case." "The Washington Post vigorously objects to the exclusion of news photographers from these facilities, which is detrimental to public understanding of the Trump administration's separation policy," he said. In this case, "we are publishing some photographs provided by authorities because they are, for the time being, the only images available." But "use of such photos is sharply limited, and we would never permit their use for an indefinite period." News outlets have generally been careful to point out the source of the imagery. "For footage inside the centers, we've had to rely on stills and video provided by HHS, which we've cited throughout our coverage," a Fox News spokeswoman said. Indira Lakshmanan, the Newmark chair in journalism ethics at Poynter and a columnist for The Boston Globe, argued that it's not appropriate for journalists to use government handout pictures. "The role of the independent media/free press is to hold the powerful accountable, and we do that with independent reporting," she said. To get around the restrictions, "some news outlets have used enterprise to get into detention centers," Lakshmanan said, "and their interviews, tapes and photos are telling the story." Most notably, ProPublica published a leaked audio recording of young children crying for their parents after being separated. With recordings heavily restricted and children prohibited from talking to reporters, the "audio obtained by ProPublica breaks that silence," the publication said in its report.